Set one year after Finding Nemo, Dory's childhood memories suddenly start coming back, pushing her to find her long lost family. 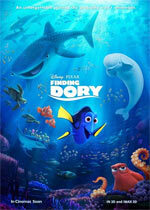 Marlin and Nemo join their close friend on a journey which leads Dory to the Monterey Marine Life Institute, where she meets an array of new sea creatures. Sunfish "Charlie Back and Forth"
Paige Pollack Regina Taufen Riley Lio Terrell Ransom Jr.